With this set you can add interactivity to your projection. The sensor captures IR-dots and translates the position directly to mouse-coordinates. 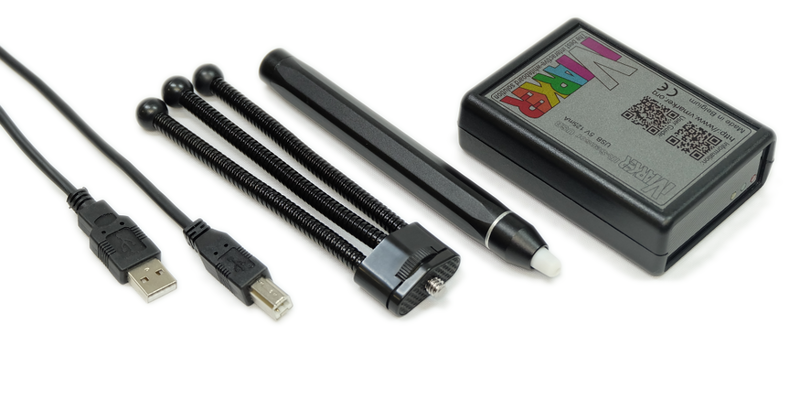 This set contains the Vmarker sensor II™, a USB cable, a mini-tripod and a basic IR-pen. The Vmarker sensor II™ detects up to 4 IR-dots simultaneously. The Vmarker sensor supports left- and right-mouse-button(1), remote control(1), mouse hover(1), cursormovement control from remote. (1) and of course multitouch. It will also handle basic IR-pens 850nm. (1)Only available with Vmarker pen II™.